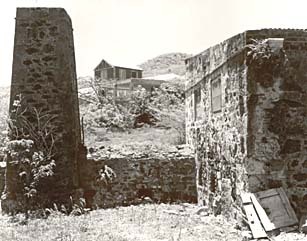 The Mary Point Great House and Factory, where cotton was cultivated and cattle grazed in the past, is associated with Governor Berg, 19th-century Governnor and President of St. Thomas and St. John, influential late 18th-century planter Augustus Kragh and the Grancis Family--all notable in the history of the Virgin Islands. The plantation itself, under cultivation before 1780, grew in the 19th-century to include an L-shaped factory located 300 feet northwest of the Great House. The original one-story mansonry of the Great House dates from the mid-19th century. A servants house, farm building and small cemetery also remain. The Mary Point Estate is located off the Leinster Bay Rd. at Mary Point on the island of St. John, U.S. Virgin Islands. Mary Point Estate has also been documented by the Historic American Buildings Survey.